The K-guard system is comprised of four main components: the hood, gutter, downspouts and the patented K-Guard hangers. Hover over the the image to learn how it works, or play the video below. Hood – water adheres to the curve of the hood and flows into the gutter, while leaves are shielded from entering. 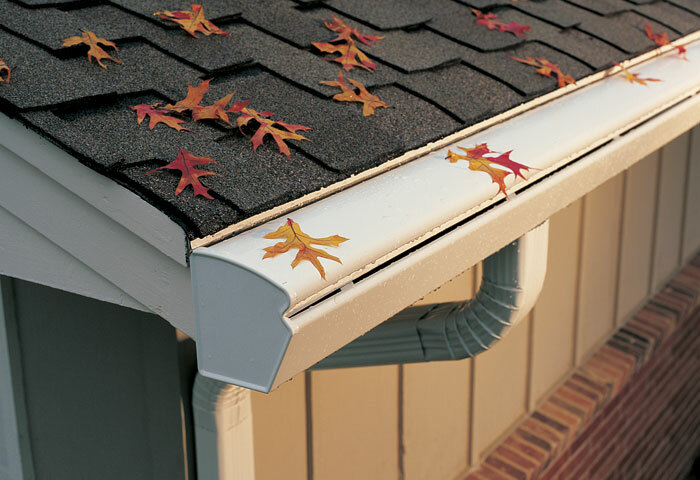 Gutter – full-sized, 5-inch gutters are able to handle more water than most any other leaf-free system. Downspouts – oversized 3×4-inch downspouts quickly flush out rainwater and any small pieces of debris that may occasionally enter the system. Do you love your house, your yard and your trees… Most of the time? Enjoy every season without the worry of debris causing clogged gutters and damaging your home’s foundation, roof and even siding. Do you worry about leaves and debris clogging your gutter system or about risking your own safety to clean them out? The K-Guard Leaf Free Gutter System is an effective solution to every homeowner’s clogged gutter problem. The durable K-Guard system consists of the hood, gutter and downspouts. Made from heavy-duty aluminum that won’t corrode, but will withstand virtually any weather conditions. The system is built around the patented K-Guard high-strength hangers. These hangers are made from all-weather polymers set every 24 inches inside the gutter. They fully support the hood and keep the gutter from sagging or losing its form. K-Guard gutters are a full 5 inches wide, allowing the system to drain more water than other, smaller systems. They accommodate the larger 3 x 4 inch downspouts to easily flush out any small debris that might leak. The variety of colors available adds beauty and function to your home. Professional installation can be completed in one day for most homes. Enjoy your home the way it was meant to be enjoyed – leaf free, clog free and risk free! Contact K-Guard today for a no cost consultation!